Can Financial Coaching Help Pay off Student Loan Debts? It’s no secret that student loans are a drag on the lives of college graduates. 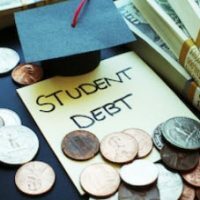 According to the latest statistics, about 70% of students who earn a bachelor’s degree end up with student loan debt, and the average debt load is $35,000 per person. And about one third of people with loans will have trouble repaying them. The New York Times has a story today about graduates who have sought the help of a financial coach to get them over the finish line when it comes to loans. The story spotlights the experience of a 42-year-old, Eddie Rodriguez, who found himself on disability payments but unable to repay student loans. Like many people in college, Mr. Rodriguez did not have wealthy parents who could foot the bill for him to attend school. Instead, he worked a variety of low-wage jobs throughout his early 20s and ultimately decided to attend community college when he was 28. By that time, he already had a daughter and a disability from being hit by truck, which injured his leg. Mr. Rodriguez’s first attempt to get a degree was not successful, but he tried again a few years later, taking out more loans while he worked part-time. Ultimately, he was over $30,000 in debt and on disability for his mental health. Without sufficient income coming through the door, he was unable to pay his loans and defaulted. Key to Mr. Rodriguez’s recovery was seeking help for his substance abuse and mental health. He ultimately was able to get sober and soon had obtained a job working at a non-profit. For help getting on top of his loans, he turned to a financial coach at Financial Coaching Corps. His counselor helped him get a 10-month payment plan that will bring his loan out of default if he completes it successfully. Doing so should also provide a boost to his credit score and ability to apply for more loans so he can finally complete his degree. What is the Best Path for You? Mr. Rodriguez’s story is unusual in some respects. Most students are not suffering from a mental health or a physical disability. But if you find yourself in default on your loans, you should consider steps for improving your situation. Like Mr. Rodriguez, you could look for a financial coach in Southern Florida. With their assistance, you can work with lenders to get loans out of default and to improve your credit profile. You can also work at developing a budget, which will help you dutifully make debt payments. Another option is to take a full look at all your debts and decide whether bankruptcy is right for you. It isn’t easy to discharge student loans in bankruptcy, but most students don’t even try. However, you might also have other debts (like credit card or medical debts) that are currently eating up chunks of your income. With those debts discharged, you will have more income available for other expenses, including student loans. Contact Nowack & Olson today. One of our South Florida bankruptcy attorneys will be happy to review your options if you call 888-813-4737. We offer a free consultation to the public.